Stripe is well-known as a PayPal competitor, but fewer business owners are aware that Stripe offers its own merchant account and online payment gateway solution. The service functions much like its larger competitor but with additional tools and more small-business friendly solutions, geared specifically towards entrepreneurs, businesses with their own development teams, and non-technical startups. However, Stripe is not a traditional merchant account, does not offer any face-to-face payment solutions, and is not based in the UK. You should look closely at Stripe’s merchant account offerings, services, and client-base before making a decision. Stripe very clearly caters to online sellers, typically very small businesses, especially startups and e-commerce-only sellers. With no face-to-face solutions and a pricing scheme that is vastly different from traditional merchant accounts, it’s important that you look closely, compare rates with traditional merchant accounts like Worldpay and First Data, and check to ensure that the company is the best solution for your needs. Stripe offers a simplified pricing scheme designed to make it easy for small business owners and startups to set up and get started accepting payments. The company also offers a custom plan for companies with a larger transaction volume who can negotiate better rates. The base contract is free, with no monthly payments, no setup fee, and no charges for additional services. Everything is included. These rates are slightly higher than the average online processing fee, which ranges from 0.75% to 2.7% + 40p. However, with no monthly fees and no additional fees, low to mid-volume sellers will still benefit. For example, Worldpay charges a base rate of £19.99 per month, offers an average transaction rate between 0.75% and 1.3%, and charges 10p after the first 500 transactions. If you have a larger transaction volume, you can negotiate a lower per-transaction rate with Stripe. Stripe offers one primary service, an online payment gateway and merchant account. The payment service does not support MOTO payments or face-to-face transactions, which means that if you need either, you will either have to add-on another service from another company or choose another merchant account service. This is important to keep in mind if you plan to expand your retail offerings in the future, simply because PayPal, WorldPay, First Data and other competitors each offer all services and Stripe does not. Stripe’s online payment gateway is a full-service tool designed to allow anyone to set up and start accepting payments online within just a few minutes. Stripe advertises an average 10-minute setup time, which is a definite plus for millions of small merchants who don’t have the time to research technical details or the budget to pay for setup. Stripe also includes PCI DSS compliance built in for hosted pages (you will have to provide your own security and PCI DSS certificate if you use the API to host on your own page), and a variety of developer tools and solutions. Stripe offers one of the strongest small-business online payment gateway solution on the market, especially for startups who need the additional help and truly need a simple solution that makes sense. Stripe Checkout is an embeddable checkout form hosted by Stripe, with PCI compliance handled by Stripe. It also automatically collects data such as conversion rate, user demographics, and other data which you can use for business management and forecasting. Checkout can also configure to connect to an e-commerce management platform for automatic shipping updates. With no monthly fees, setup fees, or termination fees, Stripe can seem extremely attractive to merchants wary of paying unexpected fees. Stripe doesn’t actually charge any fees, just the transaction cost. This can significantly reduce your total bill for small businesses, for the cost of about a 0.05% increase in transaction fees. In some cases, your rates with Stripe will also be cheaper than with a larger company, simply because very small businesses typically receive higher quotes and transaction costs from traditional merchant accounts. So, if Worldpay offers a 1% rate + £19.95 per month for an online payment gateway plus additional fees for merchant account, you’d actually have to be processing in excess of £16,000 per month before Worldpay’s rates (averages at £60 per month with all total costs) made sense over Stripe. And, at that sales volume, Stripe will likely offer you a lower rate as well. Stripe offers multiple recurring billing tools, which you can use to set up a variety of subscription-based payments including monthly billing, metered billing (for usage-based subscriptions), add-ons and options, seating pricing, and multi-plan options so that one customer can have more than one subscription. These payment solutions are ideal for a wide range of business types such as theatres, subscription boxes, web-hosting plans, lending sites, schools, and many more. 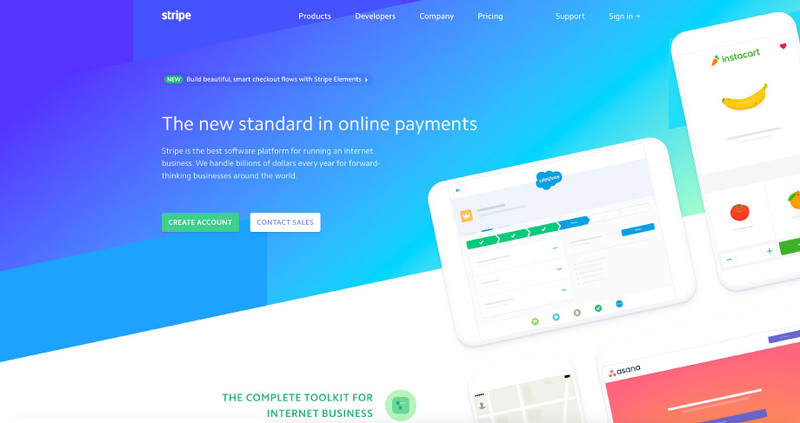 Stripe Connect is a full-service web payments platform to connect additional payment methods and accounts to a single merchant account. This allows you to connect omni-channel sales, in-person sales, and multi-step billing such as through for events, hotel booking, and multi-platform checkout. Stripe’s online payment services include a developer API with customisable code, easy integration, and a simple code structure that’s easy to update and integrate. Stripe promises that non-developers can be up and running within 10 minutes, but developers have the opportunity to create fully custom checkout solutions and data collection, compatible with Sigma. A hosted Stripe checkout page is encrypted to PCI DSS Level 1, the highest security standard available. You will have to handle your own PCI DSS certification and security compliance measures if you use the API, but if not, Stripe offers extremely good security. Stripe offers merchant account services to over 100,000 merchants in over 100 countries. The service is located in San Francisco, USA, with offices and customer service centres in London. While not a U.K. company, Stripe is actually one of the most well-reviewed merchant account providers in the UK, with primarily positive reviews online and very few real negative reviews. Most complaints surround Stripe closing accounts for suspicious behaviour or using accounts outside of the terms of service (violating the chargeback policy, accepting phone payments, etc. ), holding funds for verification, or chargeback fees. Stripe’s customer service consistent receive very positive reviews, Stripe support members work to review and solve issues very quickly, and most customers write very positively about the site. This is a stark comparison to most competitors, but the difference primarily appears to be that Stripe is a small-business centric merchant service and is therefore able to dedicate more attention to small accounts, and that the payment service does not include unexpected or hidden fees other than chargebacks. It is worth mentioning that Stripe maintains a strict chargeback policy. If your disputed transaction/chargeback is over 1%, Stripe will cancel their account with you. Stripe maintains that this is to protect the integrity of the service and to prevent potential scammers and scam products from using the service. Stripe charges a standard chargeback fee of £15, which compares very favourably to other solutions like Worldpay and First Data, both of which charge £25-£30 per chargeback. The company also includes online data management for free, allowing you to update and dispute chargebacks online where both Worldpay and First Data sometimes charge for the service depending on your contract. Stripe is an online payment gateway and merchant account service, so you can compare the account to other solutions that offer similar merchant account services. Stripe’s #1 competitor is PayPal, which dominates the full-service small-business processing industry. Like Stripe, PayPal processes payments through an all-in-one service and does not require that you set up an independent merchant account. Stripe uses a very different pricing model when compared to any payment processor other than PayPal. However, you can estimate your total costs for each platform by determining total average sales if the data is available, total value of the sale, and end totals. In most cases, you can calculate this fairly easy using estimated sales or your business plan if you don’t have existing sales data. Stripe also compares very favourably in terms of customer support, customer reviews, low fees, and customisation, making the service one of the best small-business online gateway providers. Stripe does not provide a traditional merchant account, instead offering an online-only solution for start-ups and e-commerce businesses. With over 100,000 businesses using the service, it is on the smaller side when compared to PayPal’s 30 million +, but offers rates for small businesses from 1.4%, which is less than any other online-only solution, with no additional fees other than chargebacks. This makes Stripe a smart choice for e-commerce businesses in need of an easy solution for payment processing, especially those too small to qualify for an account or good rates with a traditional merchant account service like Worldpay or Elavon. However, with no offline payment solutions, no support for call centre payments with a virtual terminal, and no PDQ or card machine rental, Stripe is not for everyone. Therefore, the service is a best-fit for e-commerce only businesses with no possibility of expanding to face-to-face retail. With low transaction rates for small and micro businesses, no additional fees, and a wide range of free tools and support options, Stripe is one of the best online payment gateway for small businesses operating online. Stripe also has an extremely good reputation, with considerably more positive reviews than any other merchant account provider in its category, customer service that stands out, and no monthly or early termination fees. As a low volume e-commerce seller, it is unlikely that you will find a better payment gateway for the price. However, if you process a large volume of transactions, Stripe may not be your cheapest option. You may also want to avoid Stripe if you have a high rate of chargebacks, operate in a high-risk industry (Stripe may freeze your account), or eventually need face-to-face sales. Otherwise, Stripe is a very good online payment solution and you should include the company in your top option.